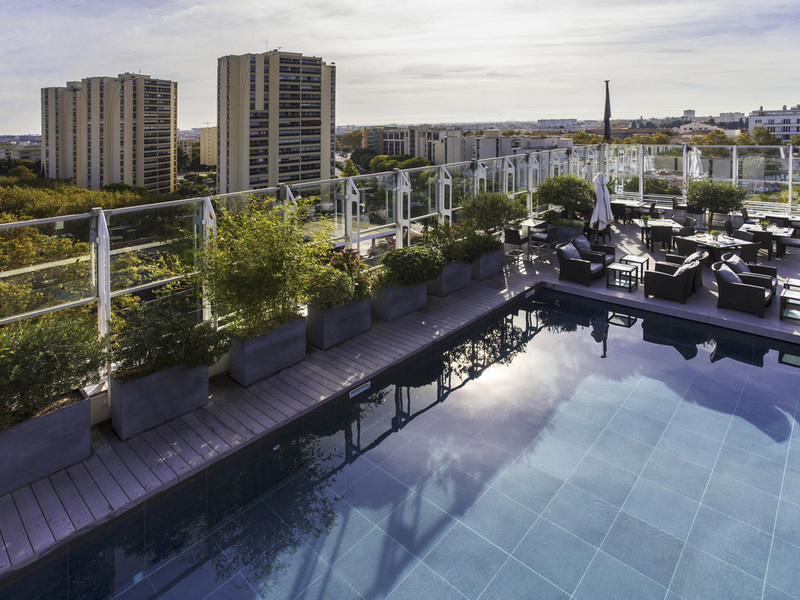 The Pullman Montpellier Centre hotel is located in the heart of the historic center near Place de la Comédie, the Polygone business district, Le Corum convention center, Zénith and the arena. The hotel offers upscale services ideal for business trips andgetaways. The hotel has direct access to parking. On the rooftop terrace, there is a pool and restaurant with a panoramic view. High-tech meeting rooms are also available at the hotel. You cannot fail to be seduced by Montpellier: from its medieval streets that are perfect for shopping to the new districts combining natural spaces and buildings designed by leading international architects, which can all be accessed via the new tramway Montpellier offers major festivals, dance, music, street art and international exhibitions, all in close proximity to the beaches of Languedoc Roussillon. Located on the roof of the hotel, right at the poolside and with a panoramic terrace, Le Vertigo welcomes you for breakfast, a meal or a cocktail. Our chef will offer you a taste of fine Mediterranean cuisine. Our bar with panoramic view, located on the 8th floor by the pool welcomes guests all year round. Discover our selection of wines from the VINOTECA by Pullman. Relax in the warm atmosphere of our lounge bar, the Zanzi'Bar! A pleasant few days. Liked the comfy beds, friendly staff and roof top terrace. Thought the room was rather on the small side and didn't like the bathroom being in the bedroom, too intrusive. There was also a strong smell of drains in the reception area, which is not good for 1st impressions. Had a great stay at the Pullman Montpellier. The room was a little dated, but pleasant enough. The rooftop pool area is small but a great place to relax. Slight smell of sewage in the reception area which was a bit off putting. However, the staff were all really friendly and attentive. Nice stay in a beautiful location. Stay was nice, we only stayed for one night. Check in was nice, counter staff was great, room was nice. Only two complaints: 1. Room seemed to stay hot. Couldn't really get the temperature in the room to drop even with turning on the AC. Not sure what was going on with it. Had to open the window to cool down a couple times. 2. Breakfast was just okay. I have stayed at many hotels and for the amount the breakfast cost it could have been nicer. Eggs were under cooked. Other items just didn't seem all that good. May have been because we were later in the breakfast window (9am ish?). Just was underwhelmed for a $50 breakfast I was expecting to be great. Overall, very good team and very good service. Very enjoyable. Hotel location and facilities are good but best of all the excellent staff. Loved the design of the room with the arrangement bathroom. Staff were very friendly, hotel was clean and organised. Despite being at a busy spot, parking was very convenient. The room was clean and comfortable and welcoming. Full of aminetes, great bathroom. But I was in a twin and not a double which made me feel a little disappointed. It was too late to change it when I arrived at the hotel. A largely relaxing weekend, only disturbed by the gilet jaune activities and the weather! The hotel was, as usual, very comfortable and offered a good service to guests including parking options when the Polygone parking was very busy with Christmas shoppers. There were no real issues (only minor problem with the light in the wardrobe which was fixed quickly) and we liked the new idea of the bluetooth Bose speaker to play music. We also appreciated the new double glazed windows providing better sound insulation from the noise of the trams passing by. We still however struggle with the temperature in the rooms being too high and no easy ability to control this (AC turned off and opening windows brings back the noise)..... Otherwise, a nice stay and we continue to return for leisure trips, despite less frequent business trips to the area. It was fine - although I did get food poisoning and had a very uncomfortable night - I’m not sure if this was from the lunch I had at the conference or the room service at the hotel. My favorite thing is how comfortable your team made me feel. I don't speak French, so I struggle to communicate well. They made me feel at ease speaking English, which felt like a safe zone for me. When I'd venture out into town, I'd use all of my mental energy trying to speak French - they made me feel okay that I gave myself a mental break when I got back to the hotel. Because I was on a business trip and I didn't have time to study the language, I really appreciated their welcoming approach. In general I am quite satisfied with the stay. Comfortable deluxe room, plenty of items for breakfast on the 8th floor, courteous staff on reception who kindly assisted me in explantion how to get to big hypermarkets around Montpeiller to purchase goat cheese. The only point that worried me is that I got an impression that no room upgrade to suite upon check in was given to me as Platinum member without clear only possible reason that both suites were booked for the same time.